Clickable 360-degree panoramas are cropping up that let you take a spin around the Curiosity rover's surroundings on Mars, but there's something missing from every picture: the massive, 3-mile-high (5-kilometer-high) mountain that's staring Curiosity in its face. It's like taking a virtual 360-degree tour of the Grand Canyon, but without the Grand Canyon. The true-to-life all-around views from Curiosity aren't yet complete, but picture-builders can fill in the details. One popular panorama on the 360Cities website, created by photographer Andrew Bodrov, is great for giving you a sense that you're right there on Mars. But don't take it at face value. The picture is not just missing the mountain: The rover's 3.6-foot-tall (1.1-meter-tall) mast, on which Curiosity's best cameras are mounted, has been airbrushed out of the picture. A Photoshopped sun has been stuck into a fake sky. Gaps in the imagery have been smoothed over, and the whole picture has been colorized. "Color photos of Mars look different, but NASA still has not published enough source materials to assemble a complete panorama," Talking Points Memo quoted Bodrov as saying. "I am just waiting for new photos." So is the Curiosity team. They're waiting in particular for the pictures of the mountain, known as Aeolis Mons or Mount Sharp. So far, the peak has been seen from the ground only in comparatively low-resolution, black-and-white pictures from the rover's hazard avoidance cameras. The rover hasn't yet pointed its color Mastcam or its black-and-white Navcam imager above the level of Mount Sharp's foothills. 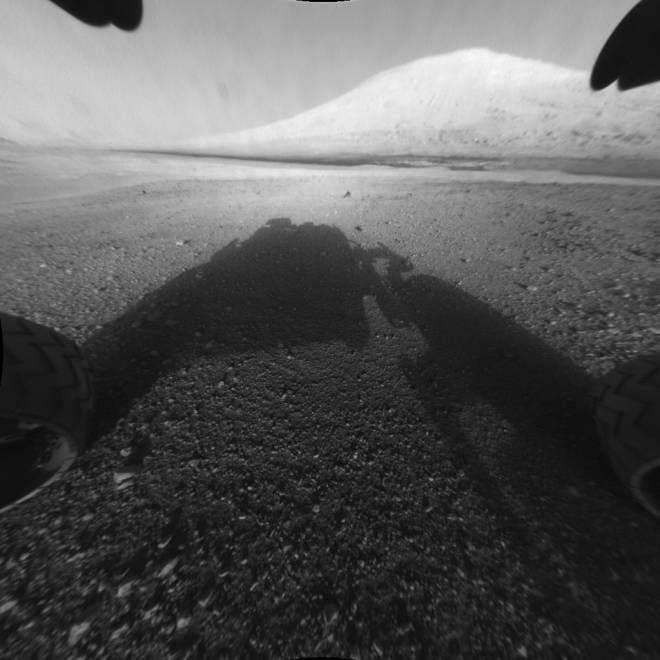 A processed picture from a hazard avoidance camera on NASA's Curiosity rover shows the rover's shadow in the foreground, and the mountain known as Mount Sharp or Aeolis Mons in the background. "We are having the Mastcam team look at targeting Mount Sharp directly, and that's a high priority for the team," mission manager Mike Watkins told me today. "We talked about it at this morning's planning meeting, and we hope to see that in a few days." Deputy project scientist Ashwin Vasavada explained that the shooting schedule for the first panoramic pictures was pre-programmed for just after landing, with no awareness of how the rover would be oriented. Now that the rover is reprogrammed and ready for new observations, it won't be long before Mount Sharp's peak is incorporated into the panoramas. "By the way, we are dying to see that image also," Watkins said. "We talk about it all the time around the control room." The Wall Street Journal's interactive provides the color view (from the Mastcam system) as well as a more complete black-and-white view (from Curiosity's navigation cameras). NASA's QTVR interactive can fill the screen with Mastcam imagery — don't mind the black patches. The space agency's Curiosity website also provides the 360-degree flat mosaic used in the interactive, as well as the Navcam's flat view. Panoramas.DK features a 360-degree interactive showing the Opportunity rover's surroundings at Greeley Haven, almost halfway around the planet from Curiosity. You'll find a pile of archived panoramas from Opportunity as well as the dear departed Spirit and Pathfinder rovers at the Arounder Mars website. The Martian Vistas website presents James Canvin's flat renderings of partial panoramas, including 3-D versions.